Since 1950, General Rubber has introduced many brands in a wide range of industries and sectors. 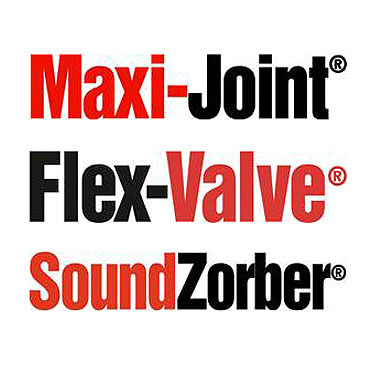 We will continue to support our legacy brands including Maxi-Joint®, Flex-Valve®, and SoundZorber®. Maxi-Joint represents our comprehensive line of expansion joints, flexible connectors, rubber flanged hoses, and related accessories, as well as spray shields and penetration seals. These products provide critical functions in piping and ducting systems including absorption of thermal movements, ground settlement, misalignment, noise, vibration, and shock. Flex-Valve represents our state-of-the-art line of pinch valves, pressure isolation rings, and duck bill check valves. These products are uniquely suited for slurries and other difficult fluids, and can outperform alternative products 10-to-1. They are abrasion and corrosion resistant, non-clogging, maintenance free, and can even seal drop tightly around solids. SoundZorber represents our complete line of noise and vibration control products, as well as seismic restraints. Our resilient mounts, hangers and pads can virtually eliminate objectionable noise and vibration. Our seismic cable and snubber restraints are designed to protect both life and property in the event of an earthquake.